As a result of making some hollandaise sauce one night to go with some delicious Cornish asparagus (sadly not our own – yet), I had a couple of egg whites knocking around in the fridge that needed using up. I also had a rose which was just about to open – a beautiful deep red scented rose that was going to have the elegance bashed out of it by the high winds we were experiencing that day. My mind went back to a party I’d hosted a few years ago when I’d made rose meringues to much adulation and applause (well perhaps only the latter). Brilliant, I’d make those. Could I find the recipe anywhere? No, of course not. Oh well, it shouldn’t be that difficult to work out I thought. And actually it wasn’t. I was rather surprised though to find the egg whites went blue rather than pink when I added the rose petals. I’m a bit cross with myself for not taking a picture at this stage, because it was such an unusual colour. In fact I’d just read a post by Johanna GGG all about blue foods or the lack of them that very morning. I shouldn’t have been surprised because remembering back, the very same thing had happened the last time. Egg whites must be quite alkaline I guess. To my disappointment, the meringues lost their blueness in the oven. Whizzed the rose petals (having removed the bitter bases) in a food processor with 100g granulated sugar until they were finely chopped and the sugar had turned a deep pink. Whisked the egg whites until firm. Continued to whisk adding the sugar spoonful by spoonful until the mixture was stiff. Dropped spoonfuls onto a lined baking sheet and baked for 1 hour at 125C. Left to cool on a wire rack. Added 1 tsp rose water to 100ml double cream and whipped until softly peaked. Stirred in 120g 0% fat Greek yogurt. Grated 50ml white chocolate (G&B) using my new grater. This time I more sensibly used a bowl whose rim fitted under the grater and I didn’t lose any of the gratings at all. Stirred this into the cream and sandwiched the meringues together with it. If I was into dainty, I could have made twice as many as I did, but as you can see I went for 4 doorsteps instead leaving me with one half left over to try out as cook’s treat (as if I didn’t get enough treats). The meringues had a lovely subtle rose flavour to them. They were crisp on the outside and chewy in the middle, which is just how I like them. The tartness of the yogurt offset the sweetness of the meringues and to be honest, I’m not really sure what the white chocolate brought along. I’d added just the right amount of rose water for the cream to echo the taste of rose in the meringues without being overwhelming or too sickly. At least I now have a recipe for the next time I’m inspired to make rose meringues! I am well impressed, they look wonderful and such a treat to be eating at this time of year. Fantastic idea! Perfect for summer! Rose meringues :-)) They sound so exotic – well done you! What a unique treat! I love the idea of using something so beautiful and natural such as flowers. Gorgeous! this looks lovely! I’m wondering if the rose is pesticide-free? Or did you grow it yourself? they’re so impressive and I adore rose in anything… did you see Vanessa Kimbells Rose and Elderflower Cordial? it would be lovely in a chocolate cake? Xinmei – if you get a highly scented rose, these work really well. Brittany – if the weather had been better I don’t think I could bare taking the rose as we have so few, but I knew it wasn’t going to fare well so we enjoyed it in a completely different way. Sonia – it was ours and we are organic. Dom – no I didn’t but it sounds wonderful. I love rose too. Gloria – thank you, roses are very special. Very impressive! Nice combination and they look lovely…i have such a battle with meringues ive given up for a while. How fascinating about it turning blue! I crystallised some of our rose petals the other day to garnish a rosewater pannacotta – using the petals in a dish itself never even occurred to me! I looove flowers! What an great idea to use your garden roses in a dessert! So interesting about the egg whites turning blue – I did a lab practical on colours recently but unfortunately not with eggs! Wow. These came out really well! Love your imagination to use a rose in your garden like that! These sound lovely and I had no idea that roses had a bitter base. That’s a good tip. They look lovely and I’m intrigued by the rose petals. The first time I have ever seen a picture of rose petals in a food processor! These look divine. I know you can use rose petals but alas I seem to have some hestitation using them. You are braver than me. It is always interesting learning from others culinary journeys. Gosh, they look and sound amazing; Who would have thought that the whites would turn blue? Incredible. Love your mixing of the petals and with the subtle rose and white choc flavours. Wonderful. They look fantastic, that deep rose coloured sugar needs to appear in another guise methinks! Foodycat – a but your crystallised rose petals must have looked fantastic especially with pannacotta. I tried looking for it on your site but couldn’t find it. 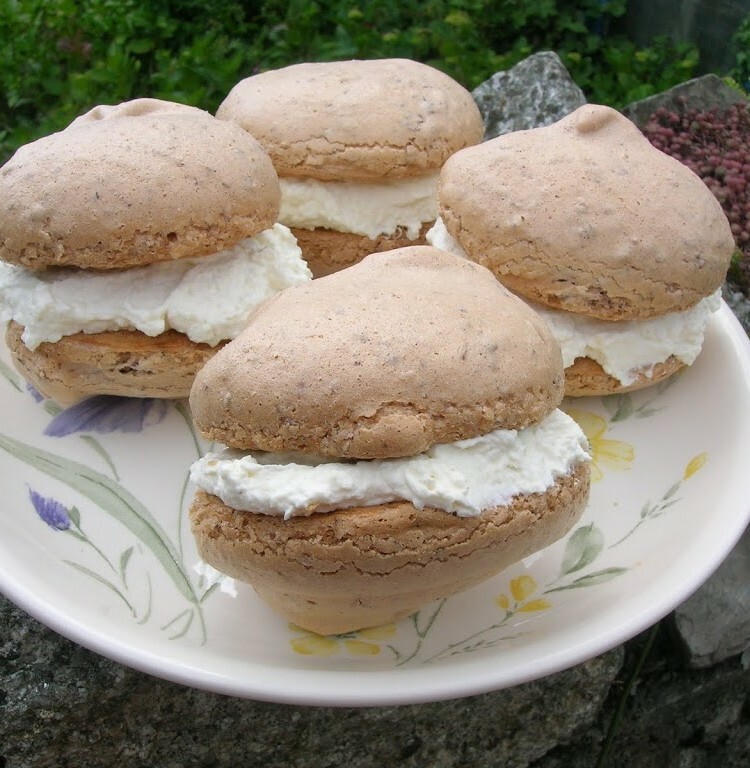 Sweetharts – yes sometimes meringues work really well for me and sometimes they just don’t! Hazel – you must try red roses and egg whites if ever you get the chance, it’s really quite fascinating. Kath – it’s definitely worth removing the bases. CityHippy – you say the nicest things. Johanna – dark red scented roses are my favourite – so luxurious as well as romantic. Grazing Kate – good luck with your summer flower project. Looking forward to hearing about your day lillies. Mary – thank you. The meringues were rather good just on their own. Sally – the colour of the roses mixed with the sugar is so deep and rich. Maggie – that’s one of the great things about blogging. I’ve picked up so many things I would not have done if it wasn’t for reading all those wonderful blogs out there. Jill – thank you. Maybe you could try roses in your macaroons and see the phenomenon of blue yourself. Janice – what do you have in mind? Ooh lovely. I adore anything rose flavoured and these look gorgeous. I’ll have to try this just so I can see the blue – shame it didn’t last and you didn’t end up with blue meringues but they look very pretty anyway. Aveen – Blue meringues would be really cool. weeks before i made rose brownines, i adored the flavour, it was os very special, now i can’t wiat to try ur i seriously think fresh rose would give a special kick…gorgeous! Ananda – I’m a bit of a rose fan when it comes to food – the flavour always seems so exotic and luxurious. I like rose things too. I spotted a “ripe” rose bush which is buried in the middle of a big deep hedge on our industrial estate tonight. It’s fields either side… Strange place for a rose bush. I wouldn’t have thought of putting rose petals in meringue right enough. Sounds yummy. How odd it went blue ! Very imaginative. That’s what I love about cooking -the chemistry ! Interesting that heat turned meringue pink again. Sarah-Jane – hope you got those roses. We’ve only got one rose, it’s fantastic but is in the shade so we only ever get 2 or 3 blooms a year from it. WLM – yes, I’m really cross I didn’t get a photo of the blue as I’m almost doubting myself now. Wow what a great idea. I’m sure it must have tasted amazing. I made rose cupcakes once but used rosewater. Perhaps I should try my hand at some gardening too! Baking Addict – I’m a big fan of rose flavoured anything. How did your rose cupcakes turn out? « Previous post link It’s Summer – Time for Hot Chocolate?